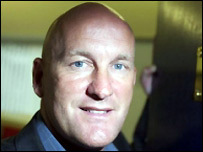 Jim Duffy is reeling after being sacked from the manager's post at Dundee. "I'm devastated," Duffy told BBC Sport. "I've been associated with this club for 20 years. Duffy had been under pressure since the club were relegated from the Scottish Premier League last season even though the Dark Blues lead the First Division. The club said: "Jim leaves with the respect of the club for the leadership, selflessness and loyalty which have been a consistent hallmark." Gerry Britton and Gordon Wallace will step in to manage first-team affairs for Saturday's trip to Hamilton. Duffy had received the backing of the board during the summer but a rift developed after the team's 3-1 CIS Cup loss at Stranraer on Tuesday. The former Hiberian boss had planned to honour his contract, which had one year left to run, and had even agreed to take a pay cut. "I'm bitterly disappointed but I totally respect the decision," added Duffy. "I bear no animosity towards the club and I hope they go straight back up to the SPL." Dundee had been so keen to keep Duffy that in 2003 the club turned down Partick Thistle, who had wanted to employ him. Now, Dundee have pledged to find a replacement for Duffy within the next two weeks.